When he found out that Jose Aldo had pulled out of their UFC 189 title fight, and that Chad Mendes would be taking the Brazilian's place, Conor McGregor is credited with the line “They're all the same.” In terms of badassery, that is on a level with prime Schwarzenegger or perhaps Roddy Piper in They Live. As fighting philosophies go, it is dangerous. Nate Diaz proved to McGregor that they most certainly are not all the same when he stepped in to replace Rafael dos Anjos. Conor McGregor, who had proven so remarkable at making adjustments on the fly in the past, soon abandoned the well known anti-Diaz playbook and was swinging wild for Diaz's head and eating counter hooks en route. Diaz's long stance and comfort under fire soon had McGregor overextending and finally getting wobbled in the second round. 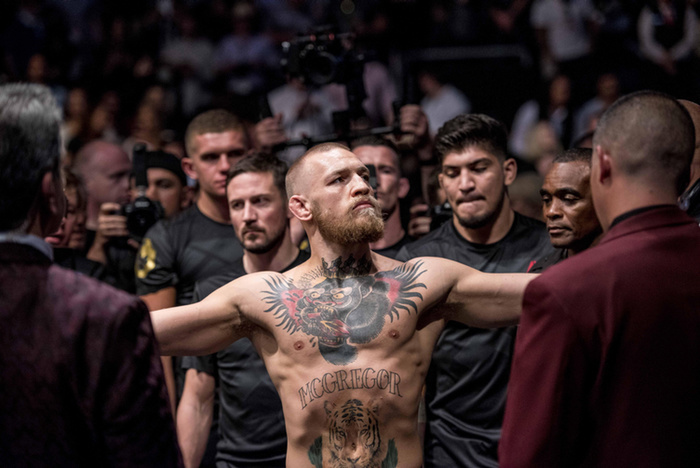 In the second Diaz fight, which the Irishman took in a grueling five round decision, we were treated to a different Conor McGregor. A McGregor who had to work to the gameplan and mind his Ps and Qs. McGregor in a new division, at 1-1 against world class lightweights (the same one), a McGregor who isn't untouchable. Whether you believe he should be jumping the queue in the most talent rich division in MMA or not, it is hard not to feel excited for McGregor's shot at the lightweight title at UFC 205. Big fight nerves are hardly likely for the champ, Eddie Alvarez, though. He's fought more top tier lightweights than anyone in the game. Bursting onto the main stage at the DREAM lightweight grand prix as a wrestler with heavy hands and a habit for taking punishment, Alvarez rapidly developed into a talented, technical striker. After a tough start in the UFC in a loss to Donald Cerrone, Alvarez rebuilt his momentum to earn a title shot where he knocked out the great Rafael dos Anjos inside of four minutes. At featherweight, Conor McGregor made a habit of moving forward, cutting the cage on his opponents and pounding them with long front kicks to the body and left hands until they advanced at him, whereupon he would give ground and look for his famous back-skipping left hand counter. This was the punch which decked Buchinger and Aldo, but it was also the beginning of the end for many of McGregor's other opponents, including Chad Mendes. The concern for Alvarez is that one of his go to methods has always been the level change right hand. Whether it be a hook or a straight to the body, Alvarez likes to come in low. Against Donald Cerrone he was intercepted with knees and kicks, but against McGregor the danger is the counter left hand. For a comparison, the great Gene Fullmer was famous for the wide right to the body. When Sugar Ray Robinson was training for Fullmer he focused on drawing the wide right to the body and landing the left hook on Fullmer's exposed left jawline. The angles and distances are, of course, slightly different in a southpaw v.s orthodox fight, but the principle of the right jawline being undefended remains the same. The key to the McGregor counter left generally is the same as for any Anderson Silva counter or Muhammad Ali's “anchor punch.” Getting fighters to overcommit and fall short, their ineffectual technique culminating in the counter puncher's striking range. The way to kill it, in principle, has always been disciplined distance management. It's tough to say “don't lash out” but many of McGregor's opponents have come off the fence to move straight at him and lunge for his head right off the bat. Any technique which relies on giving ground cannot be repeated infinitely because there is only so far to go without hitting a barrier, be it the ropes or the fence. The way to deal with a fighter giving ground and looking to counter is to focus on taking the ground rather than hitting them. You will be familiar with this in boxing—it is the double jab. Staying on top of his feet the fighter throws the jab out ahead of him, exposing himself as little as possible while being glad to follow his opponent to the ropes or until they stop retreating. It's never good to look too much into sparring footage, but you will notice that in McGregor's sparring sessions with experienced boxers he is much less effective with the back-skipping left hand because boxers are taught to stay on top of their stance and not to reach, they also show plenty of feints which make it more difficult for McGregor spot their intentions. Against a southpaw, the double jab works but can get caught up in the lead hand if the opponent is actively handfighting. The double right hand works a treat. Julio Cesar Chavez used this repeatedly against the fleet footed Hector Camacho to get him to the ropes. Chris Weidman, one of MMA's best ring cutters, used the double right to herd Lyoto Machida into the fence, and shot a couple of successful takedown attempts from it. Alvarez showed the double right on a couple of occasions against Anthony Pettis, who he was able to get to the fence time and time again. Along the fence is where the fight gets interesting, no matter whose back is against it. McGregor puts in pounding kicks and long left hands along the fence, looking for back kicks and wheel kicks when opponents circle past his lead leg. This was all covered in Fightland's Ringcraft series. But Alvarez has always been pretty good at getting away from the fence before it becomes a problem. Fighting Rafael dos Anjos, one of the best pressure fighters in the game, Alvarez remained disciplined and never stood still long enough to dig himself into a hole. As we said in our post fight piece, better to take a single glancing punch on the way out than be stood there for more. While we speculated on the danger of Alvarez's level change right hands, his favorite dart might prove a useful point scorer and escape technique. While it is designed to score the right hand and take him past an orthodox fighter's right, it works just as well moving into the blind angle past the southpaw's lead foot. The dart against an orthodox opponent. Additionally it is not unlike a leverage guard, the body is turned to almost side on behind the right shoulder, making the McGregor counter left a trickier proposition. Against Michael Chandler, Alvarez really showed the necessary ringcraft, changing directions repeatedly and getting Chandler to overcommit in one direction before escaping out the other. Simple but subtle and almost never seen in mixed martial arts. When talking about 'boxing' it's easy to obsess about a fighter's hands, but boxing is as much about the feet. Here McGregor's sparring partner circles past his lead leg (a difficulty for any southpaw in a long, bladed stance), shows direction changes, and uses a dart to get out the other side. Sound defensive ringcraft makes it very hard to stay on top of a man along the fence. Dominick Cruz is the best example of this in mixed martial arts but Alvarez is one of the few others who can claim to practice it well under the ring lights. The fence should be the biggest story for McGregor at lightweight. Most takedowns in the modern game come along the fence, and against the fence McGregor's brilliant distance management is no longer a barrier against takedown attempts. Nate Diaz was a fighter who could make McGregor suffer with his reach, but isn't the sort of fighter to make an opponent carry his weight. Diaz did fairly poorly trying to muscle McGregor along the fence, as the featherweight champ was able to break his hips away and often land a slick elbow which he would then turn into an underhook and use to move Diaz's back to the cage. These elbows opened Diaz's face up excellently. However, Diaz's best successes came by using the fence to infight rather than wrestle. Getting his head below McGregor's to force the Irishman upright, Diaz freed his hands and was able to dig blows to the body with both hands. Possibly the most underrated striking position in MMA right now, this is where Jon Jones did much of his damage against Glover Teixeira and Daniel Cormier. These flurries were the ones which sapped McGregor's energy and had him struggling in the middle rounds. While it is unclear how well McGregor will hold up in the clinch against a strong wrestler like Alvarez, he held his own against Diaz. McGregor didn't seem confident in uncorking his usual body and high kicks against Diaz, but it would be good to see them return against Alvarez. Especially as Alvarez does not have those few inches of height on McGregor that Diaz did. Donald Cerrone was able to change Alvarez's attitude entirely with some intercepting knees and kicks to the body early on. While the back kick might be an unnecessarily risky technique, Alvarez's active circling along the fence might make him a decent mark for this or the wheel kick if McGregor is feeling particularly confident in his counter wrestling. A return of the low line side kick might be in order, as McGregor is once again fighting an orthodox opponent, making it more feasible. Low line side kicks are among the most difficult kicks to catch for a wrestler, and that involves reaching down which can be exploited later on. McGregor utilized the low line side kick to set up jumping round kicks to Max Holloways midsection and the shorter Dennis Siver's head. Siver was also hit with a couple of jumping knees off of a faked side kick. Though Siver also had success in the early going by throwing the low line side kick back as soon as McGregor began throwing them. These made McGregor reluctant to step in for much of the early going until Siver began missing in his commitment to throwing so many. As we noted before the Dos Anjos – Alvarez bout, Alvarez has a tendency to change levels and step in on opponents as they advance. Smart boxing, but if he goes to it too often he can expose himself to the uppercut. Dos Anjos nailed him with a good lead hand uppercut, one of McGregor's favorite punches. The latter was apparently working on this in preparation for Dos Anjos and his corner kept calling for it against Diaz the first time around. For Alvarez, it would be good to see him attempting to exploit McGregor's linear retreats. Double jabbing or doubling up on the right hand to make McGregor give ground, but remaining over his feet and ready to slip or block the left hand. Alvarez has powerful low kicks (having TKOd opponents with them before) but doesn't go to them as often as he perhaps should, being such a keen puncher. They were useful in knocking Dos Anjos out of stance—something Tony Ferguson followed up on over the weekend. But against McGregor he could make use of another ground taking technique from the kicking arts. Raising the lead knee and coming in behind it, making McGregor give ground before kicking the lead leg. This is a good technique against fighters who retract their lead leg or retreat out of range rather than checking kicks. The same might be paired with high kicks as McGregor carries his hands low when he back tracks. An example from Justin Scoggins. This method of advancing can be seen in many Muay Thai and Taekwondo matches. Nate Diaz learned about midway through the second round that it was lashing out at McGregor that was getting him countered. When Diaz simply put up his forearms and advanced, McGregor could not land the clean shots and get away free of charge. The crisp counters were replaced by ugly exchanges which tired McGregor and the clinch often followed. Alvarez might well be best off not trying to move in and out, but simply to cover up and get in, then focus on holding and hitting. Working the body is a favorite of both men, and both men have also shown that the strategy can be effective against them: Alvarez against Cerrone, McGregor against Diaz. McGregor's guard is considered something of a question mark because he showed so little from that position against Mendes. This was what made the Dos Anjos match so interesting, because the Brazilian will advance, trade punches, and cut the ring until he can get the opponent's hips between his shoulder and the fence, then he'll pull their legs out and hold them in the guard for the rest of the round. McGregor's most effective work from the guard against Mendes were the elbows to the top of the head and the basic technical stand up, often getting hit on the way up. If Alvarez can keep dumping McGregor to the guard along the fence he could well get off powerful blows on the way up and exhaust and damage McGregor in this way. Ten seconds or twenty-five grueling minutes, this fight promises to be a treat. Add the other two title fights and the brilliant prelims and the lucky citizens of New York are getting the biggest event of the year. Get back to Fightland on Wednesday for a look at the rest of the card, and Monday for the recap of all the action.